Audience of One (Ao1) cannot accomplish its important mission without financial support from the local community it serves. A valuable way you can support the Ao1 family is to provide a tax-deductible donation. 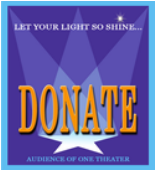 Your generous donations will directly impact Ao1’s ability to continue providing quality training for our children and productions for our community. Ao1 is a 501c3 non-profit organization and all donations are tax deductible. Join our circle of supporters today! With your support Ao1 will continue to build self-esteem and integrity in our most valuable resources; our children.